This, along with the info from dsl's book suggets that the names applied before our current 1990 cutoff. Do we move to a naming convention using the C and S codes or just stick with the current convention (even the Mercedes employee says that the Wxxx codes can be used as a general name for the whole series)?. We have 83 pages of assorted W123. If we want to change, then it relies on block updating big swathes of stuff quickly and easily. Which should be possible using the Class section (Sedan/Coupe/Wagon) but could get complicated for digesting all the funeral class. And do Langs cause any problems - was there a V123 code?? I have emailed them about the Lang model naming convention. I am awaiting a reply at this point. Ok I have just received their reply. 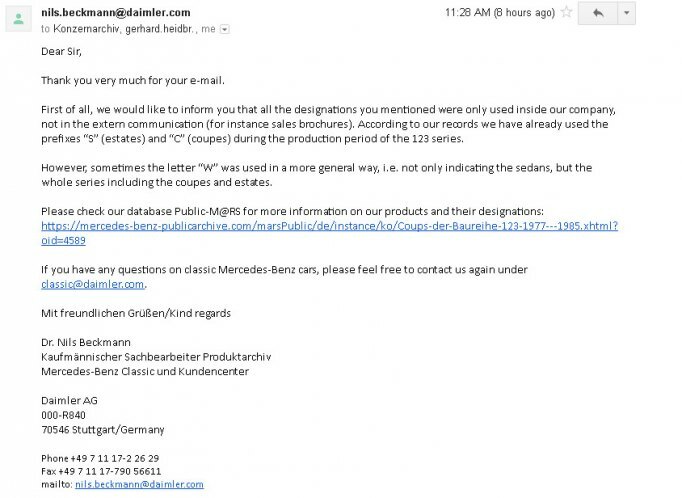 That link shows the limo as (V123), chassis as (F123) and there's Lang chassis (VF123). Along with the coupes as (C123) and Estates as (S123).